Her life isn’t what she expected. At 31, she’s returned to her home town of Plainsboro, Alabama, her daughter on her hip. She’s stuck in a dead-end job selling real estate, just making ends meet, with the help of her family. Her life is turned upside down when a rich, enigmatic stranger walks through her door. His past is elusive – his behavior both clumsy and, at times, thoughtful. Thrown together by a worldwide storm, together they attempt to save who they can, and defend themselves and her daughter. 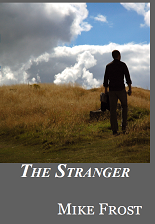 Forced to confront his past, she tries to learn if she can really ever trust The Stranger. So, I’m not dead. At least, not yet. It’s been a while, and I wanted to let you, my faithful readers, know that I am back. Back to writing, back to crafting a few words. There will be more coming soon, so keep an eye out. Some people ask me why I became a writer. In my opinion, that’s like asking Hank Williams Jr. why he drinks? It’s an easy question to answer – because I enjoy it. It’s not that writing is easy or even pleasurable at times. The fear of the blank page affects me just like it strikes fear in the hearts of every freshman student out there who gets a writing assignment. But the difference is that I don’t give up. Lord knows I find ways to procrastinate. That’s what I’m doing right now, as I write this I have another window open on my PC with half a scene written. In honor of the President's Day holiday weekend, I've created a sale on Homo Luminous at Smashwords. Go to https://www.smashwords.com/books/view/35082 and enter code TE86Y at checkout for half off. Sale ends February 22, 2011. So Amazon has finally gotten its act together and gotten my book pages together and linked. Now you can find both the print and kindle editions together, and the reviews are linked. Also, got another great review today. Please feel free to add reviews (good, bad or ugly) if you've read the book. Homo Luminous - Now available in print!